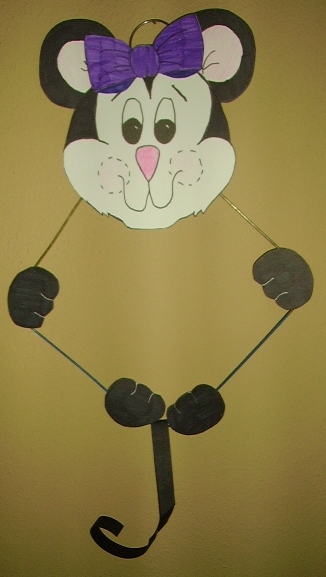 This little wire coat hanger mouse would be welcome in anyones house, so we call him or her “House Mouse.” Again the main supply needed in this project is a wire coat hanger—–if you send a note home with the kids, you’ll get tons of them. We have patterns included for the mouse. The boy mouse gets a bow tie for his neck, the girl mouse gets a bow for her head. Directions for this project, ” House Mouse,” is in the Miscellaneous Projects Gallery in the sidebar. This entry was posted in Miscellaneous and tagged arts and crafts for kids, craft projects for kids, crafts for kids to make, house mouse, wire coat hanger, wire coat hanger projects, wire hanger mouse. Bookmark the permalink.